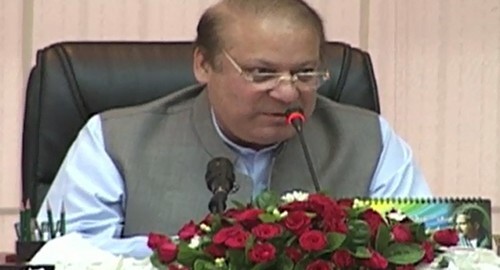 ISLAMABAD (92 News) – Prime Minister Nawaz Sharif has on Friday chaired an important high-level meeting in Islamabad. The meeting was attended by Chief of Army Staff General Raheel Sharif, Interior Minister Chaudhry Nisar, Finance Minister Ishaq Dar, Director General Inter Services Intelligence (ISI) and other high-level civil and military officials. During the meeting, Prime Minister Nawaz Sharif reaffirmed the resolve to root out the scourge of terrorism and extremism. The meeting discussed external and internal security situation and strongly condemned the blast that targeted government officials in Peshawar on Wednesday. The meeting further reviewed progress on the ongoing military operation. It was noted with satisfaction that the operation has made significant gains.